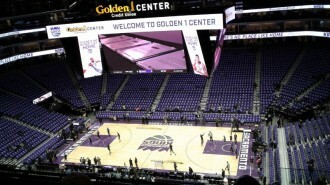 Sacramento, California - The score was 68-66 with the Kings on top midway through the third quarter. Sacramento has been controlling the game right from the start to that point with the ball in their possession. Then Kawhi Leonard literally grabbed the ball away from Ben McLemore and drove all the way to the basket for an 'and-one'. In the ensuing play, the reigning back-to-back Defensive Player of the Year awardee ripped the ball again from McLemore for another fastbreak finish. Leonard was once again superb all around with a team high 30 points to go along with 3 rebounds, 5 assists, and 5 steals to lead the Spurs to a come-from-behind 102-94 victory over the Sacramento Kings at the brand new Golden1 Center in downtown Sacramento. "He took two away in a row and said, `Gimme that.' He just grabbed it away from whoever it was," Spurs head coach Gregg Popovich said. "He just grabbed it and took it twice in a row. I don't see many people doing that." The San Antonio Spurs stay undefeated barely two days after they clobbered the Golden State on the Warriors' home floor on opening night. The Sacramento Kings are now 1-1. Both teams were shooting in the low 30s from beyond the arc with only six makes apiece. The Spurs swatted 8 shots, while no Kings player recorded a blocked shot. Gregg Popovich's wards also took better care of the ball with only 9 turnovers, while Dave Joerger's Kings turned the ball over 15 times. Kings big man Demarcus Cousins led all scorers with 37 points on 10 for 22 field goal shooting and made 14 of 16 shots from the charity stripe. He also made 3 of his 5 attempts from the rainbow territory... but his efforts were not enough to stop the balanced attack of the Spurs, who had 8 players with at least 5 points to his name. For the second consecutive game, the Spurs bench asserted its dominance over its counterparts. San Antonio's shock troopers tallied 43 points, while Sacramento could only muster 18 from its second unit. Sacramento was leading 9 points midway through the third quarter when Leonard and company engineered a 16-2 run, holding the Kings without a field goal in the final 7:20 of the third frame. The Spurs then built a 10-point lead early in the fourth when the Kings went on a 12-2 run led by Cousins and Arron Afflalo to tie the game. But the Spurs kept pounding the rock, commenced by a cold-blooded fade away jumper by LaMarcus Aldridge to silence the raucous crowd. Kawhi Leonard had 5 steals, just like he did versus Golden State. Sacramento had this one for the most part... until the Spurs decided to steal it away from them for good. Photo: The brand new Golden1 Center in downtown Sacramento.